This tip will be so unnecessary for many of you that I almost hesitate to write it. I am always amazed, though, at how freely some people give out their email addresses, and the email addresses of others. My wife knows that this is a pet peeve of mine. When I see an item show up in my inbox due to her submission of my email address on a site, my blood pressure boils. And I’ve seen her and others register on all sorts of sites using their main email address. Many sites have privacy policies in which they assure you that your address will not be sold or used, but plenty of sites have opt-out provisions buried in hard to find places. There are a few easy ways to protect your address, and the addresses of your family and friends. I receive email from Amazon, eBay and countless other sites, but not in my main email. How? I have a “bacon” address. “Bacon” is a term that is used to describe email that is not quite spam, but isn’t a typical message from someone you know personally. Typically, the term refers to email sent to you from a site with whom you’ve previously dealt. For example, if you make a purchase from Amazon, and then start receiving emails from Amazon containing solicitations and advertisements, that is what is often called “bacon.” A bacon email address is an address, other than your main address, that you use when registering on websites. With free email addresses available from Yahoo, Gmail, Hotmail, and elsewhere, there is no reason not to do this. I have a Yahoo account that I use whenever registering on a site, whether it be a blog or an online merchant. Every couple of days, I quickly scan over that account just to make sure I’m not missing an important message. I can’t remember the last time I have missed such a message. You can also use disposable email addresses that you use, and then forget about, but I haven’t tried any of these so can’t vouch for them. Yahoo even offers this as a service. Protecting your own address is only the first step. You should also respect the privacy of your family members and friends, by protecting their email addresses as well. First, when you forward an email message to a number of people, most email programs also forward the header of the original message. That header typically contains the addresses of the person who sent you the message, and the addresses of all the people to whom the message was sent (including yours!) by the original sender. After a message has been forwarded on several times, it can contain a trove of email addresses. Delete those headers! Not only will you protect the addresses of everyone whose address was in the header, but you also will save your recipient the hassle of having to scroll through a long header just to see the content of the message you forwarded. When you find an item on site that you want to send to someone, whether it be an item to purchase or an interesting news article, don’t fill out the form that many sites contain that asks for recipients’ email addresses. Instead, copy and paste the link for that site into a message, and email it yourself. Due to the way that the databases of some online merchants operate ,this won’t always work. You can usually sufficiently describe an item (product name, item number, etc.) so that you can avoid filling out an email form on a merchant’s site. Remember, email addresses should be treated as private. Take steps to protect them. Google Chrome Operating System – Able to Promise Big Because it Delivers Small? Evan, I''m amazed on the amount of spam I receive every day. Fortunately gmail is good a filtering it, but from now on, I'll try to follow your advice. 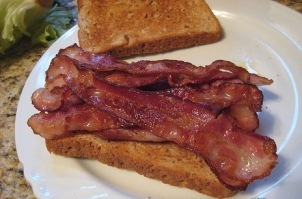 We're using “bacon” to describe a lesser class of email? Yikes. I understand why we use the word “spam”, but as a member of the species carnivorous baconis I am disappointed to see the good name of bacon dragged into this! We have an email set up for bacon, as well as for requested daily stuff (Dilbert cartoon for me, a couple dozen things for my wife). It's not a truly separate account though, as we auto forward everything to the main email address. The whole intent of this email address was to be able to kill it off at a moment's notice if it starts becoming a spam magnet – with no effect to the main email address. Evan – I figured out why your comments on The Casual Observer were getting tagged as spam. For some reason, you were on the blacklist. This has been fixed. Not sure why that happened. That's a nice system to have. In a way, that has me wondering if it might be good to have a 2 level system- one “trash” address, and one address for email that I “kinda” want to get, that forwards to my main address. I do this somewhat with an address I use for things like Facebook and Twitter updates, but your method has me thinking that maybe I should use it more. You guys are killing me. :) Maybe I'll just call it “liver” email, since that is something that some people think is OK, but I don't like.